For more than 15 years I went to woodworking class at a local highschool. It wasn’t really ‘class’ in the learning sense – I just went there to use the industrial equipment and to have three uninterrupted hours of focus and productivity. I’d still be doing that but because of … I don’t know what – insurance/budget cuts, they discontinued it. While most folks worked away on some impressive project – often from one semester to another or even one year to another, I worked on dozens of little things all at the same time. If one machine was busy, I had something ready for another. I looked like a mobile manufacturing company with my baskets of pieces. The instructor once approached me and asked me if I was dying. Strange question, I thought and replied ‘I suppose at some point. Why?’ He answered ‘You work like you’re going to.’ Really, what I was working like was a mother of four with no time to myself and no equipment at home. 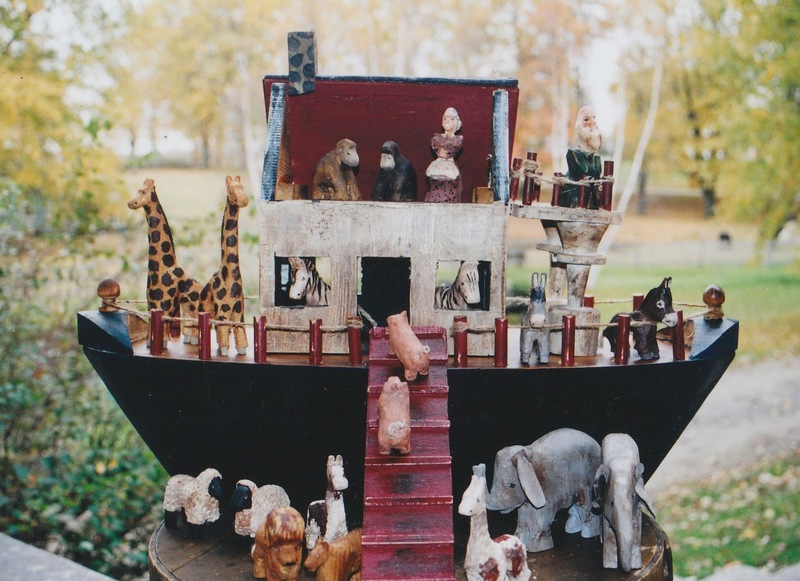 It was there, in 1988 that I made my first Noah’s Ark as a Christmas gift for my friend’s six year old daughter. That same teacher said ‘What is it?’ ‘It’s a boat.’ I answered. “Hmmm …doesn’t look like a boat.” he replied as he walked away. “Well it’s MY version of a boat.” I shot after him and carried on undeterred. 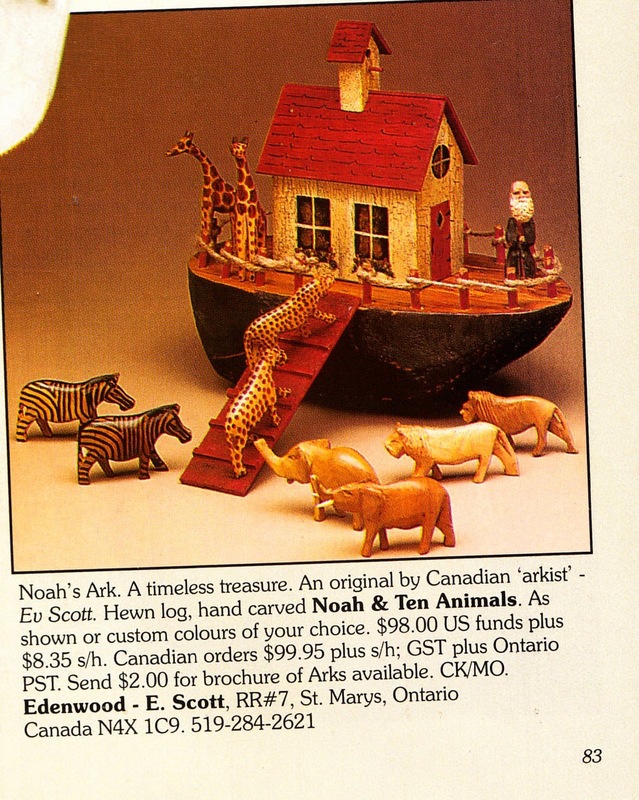 As it turned out, my friend enjoyed the ‘non-boat’ so much that when opportunity arose a few months later and we started a retail venture together, we named it ‘Noah’s Ark Studio’. 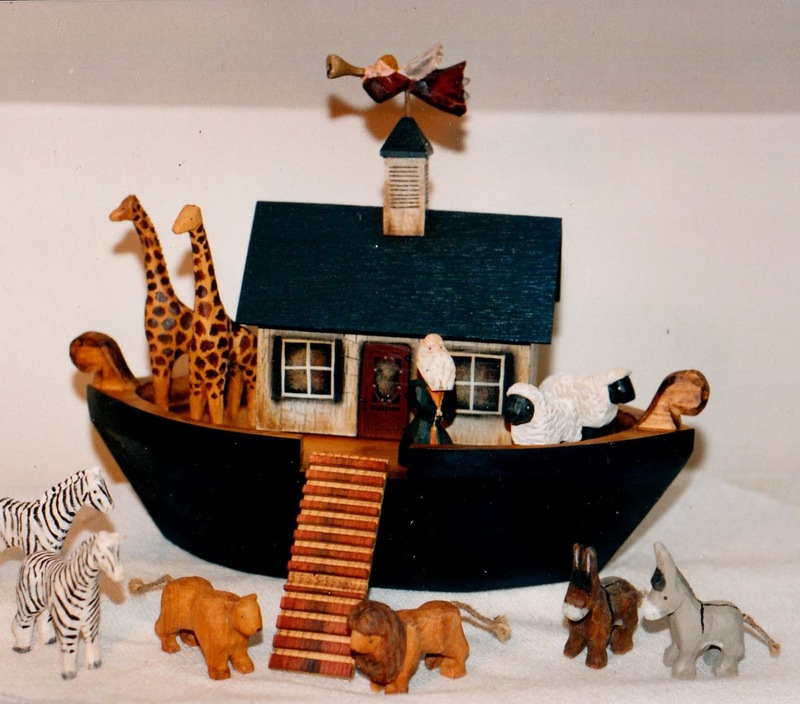 I always remember the very first ark that I sold to a first time grandmother as a baptism gift for twins, one named Noah. 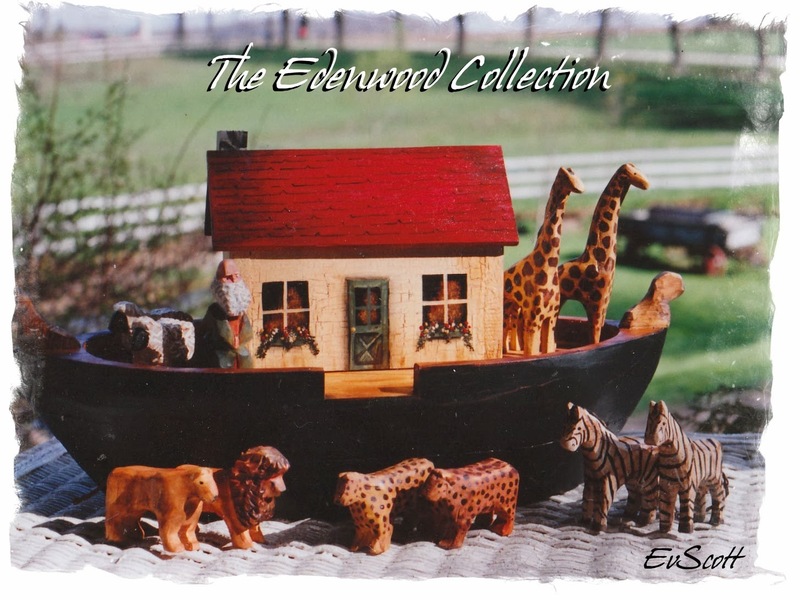 For the first four years the animals I used were mostly hand carved wooden ones from Kenya. The local Self Help store where I purchased them couldn’t supply enough so I wound up having to import them directly myself. 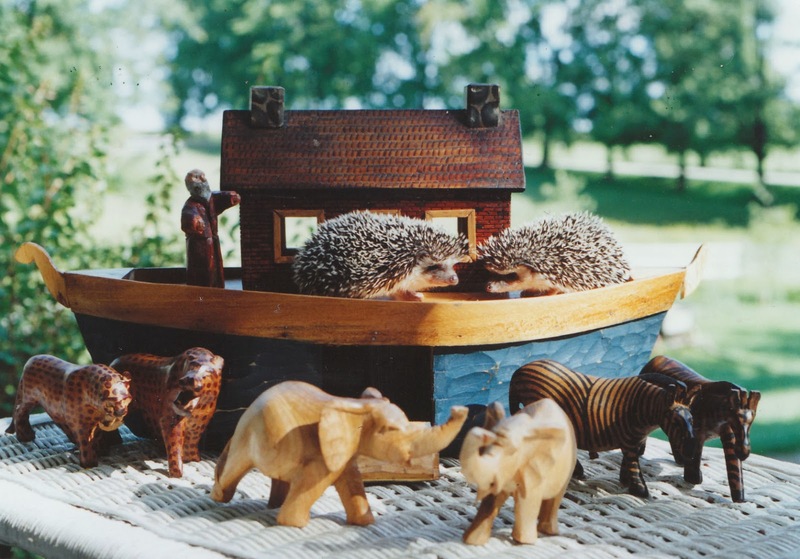 In 1992, I was showing a friend a relief carving of an ark that a fellow had done to sell at our store. “You can do that.” he said. “No I can’t - I can't carve.” I replied. “Of course you can,” he stated, “you can do anything.” And I agreed - what was I thinking! OF COURSE I can do anything! It just so happened that right about then I was heading to a trade show in Pennsylvania. Eleven hours driving. There was no such thing in my life as having 11 hours where I did not produce something. It was as good a time as any to try my hand at carving. I sketched some animals, cut them out of pine and packed them along with a little Xacto knife with one single blade. My sister, being the more practical, and perhaps the more sane of the two of us – and also an Emerg nurse, flatly declared “You canNOT carve in a moving vehicle.” People really shouldn’t say ‘cannot’ to me, it’s kind of like a red cape to a bull. “Sure I can.” I said and did. When it wasn’t my turn to drive I sat in the back of the van and whittled away – wood chips flying everywhere. I was pleasantly surprised when the animals started taking shape. I can still see myself holding the finished giraffe up to admire. Seeing a tiny spot that just wasn’t right, with great gusto I gave one last flick of the dull knife. It sliced my thumb from the nail right to the lower joint. I had nothing to contain the blood that was pouring everywhere so I had to confess to the front seaters. “Could someone hand me a plastic bag?” I calmly asked. Well, you can imagine my sister’s reaction. We were on the thruway with no where to slip in and get it stitched up, so I just wrapped it in Kleenex and held it tight for hours until it glued itself back together. By the time we were heading home, I was back at it. And so I went on with my ark production. Because of the sheer amount of time it takes to carve, I still made them not only with the wooden Kenyan animals but with every type imaginable. I couldn’t look at a single animal figure without seeing it with its mate and shipmates. I put them together in glass, ceramic, plastic, plush, rubber, bone and stone. 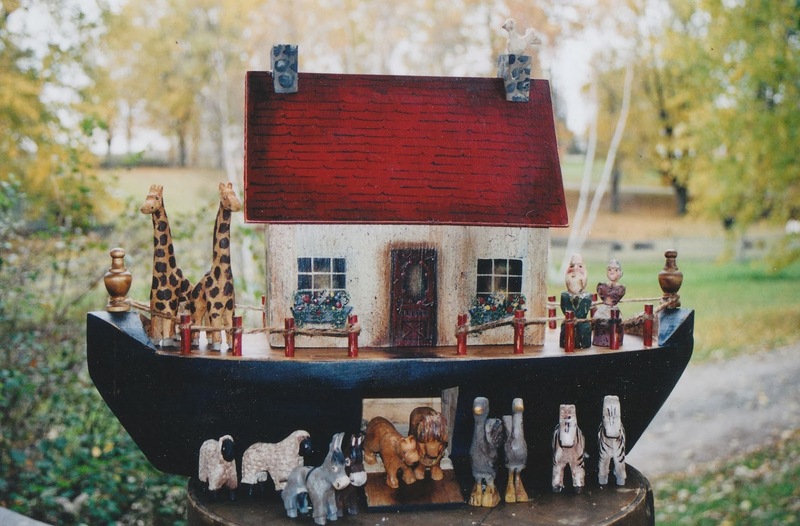 I would build them a boat, which had evolved to looking a little bit more ship shape, carved them a Noah and set them off to sail into the world. It was such a different world back then. No Internet. No Ebay. No Paypal. The only way to reach the world was costly advertising in a magazine. 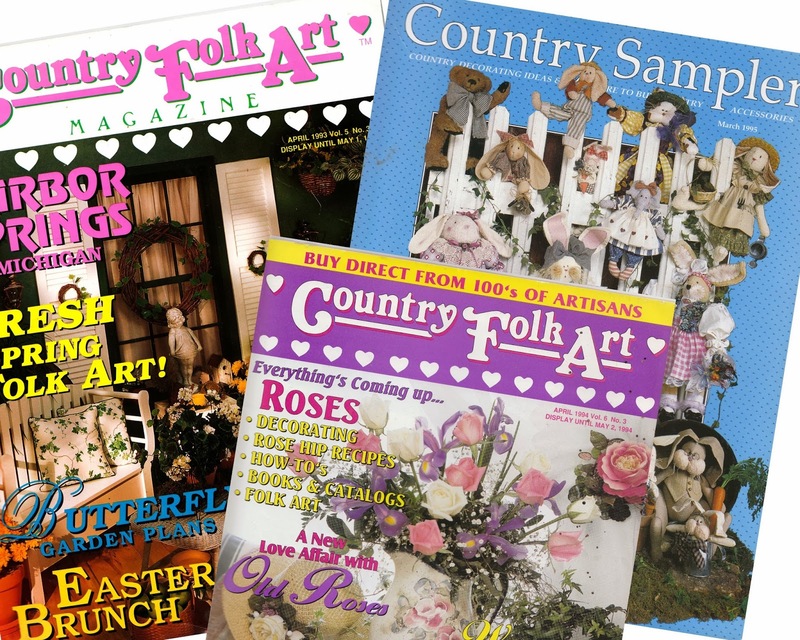 I used Country Folk Art and Country Sampler – both wonderful publications that were the ‘new thing’ at the time, offering artisans a marketing vehicle. With the exchange on the dollar, an ad cost me about a thousand dollars. I could buy a new computer for that nowadays.It was big bucks to have your product shipped to the US to be photographed, then pay shipping and import duties to have it returned - no digital photos that you could just upload. Back then, the people just trusted you and sent off a cheque and I trusted that they were good, never waiting the 21 days it took to clear. Which, ironically now they hold US cheques for thirty days. There was no contact with each other – no email, no website to check out for credibility, no tracking of the parcel to watch on line. 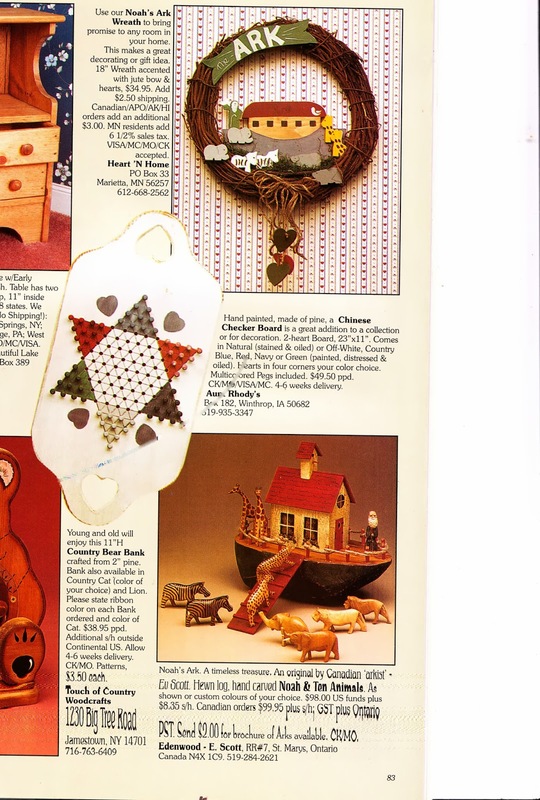 My first ad attracted more than a hundred buyers, which meant I had to build over a hundred arks in a matter of weeks. I would have a dozen orders on any given day. Slightly overwhelming is an understatement. Brian declared that I was the only person he knew that would be upset when there was money in the mailbox. I did that to myself three times. Then I did something even sillier. 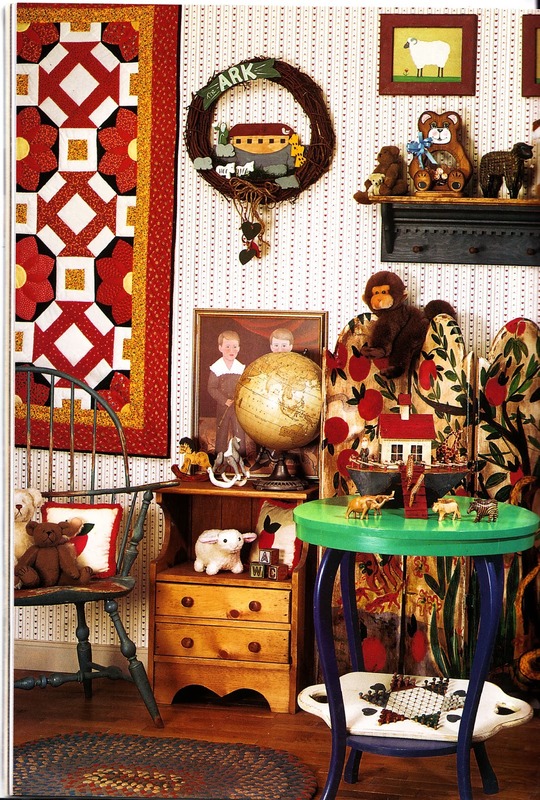 In 1998 I took a sample of little Ark on wheels to a wholesale trade show in Pennsylvania. ; wholesale meaning I got half of what I normally did. I was very honoured that Shaker Workshops in Massachusetts picked it up and offered it in their catalogue. I would get orders for 4 or 5 dozen at a time for a number of years. Poor dear hubby. I had to recruit him to put the wheels on as precision is just not my thing. I’m often better at concept than I am at execution. First he would have to ‘make’ all the nails as the ones that I insisted on as axles only came in the 2 inch size and I needed half inch. He’d cut them and grind a point on each one, then sit at the table at nights, tired from his own full day, drilling holes in the massive pile of arks and set the wheels so they didn’t wobble. So many times he would say ‘If I had to do this to make a living, I’d shoot myself.’ Meanwhile, he was doing it so I could make a living. 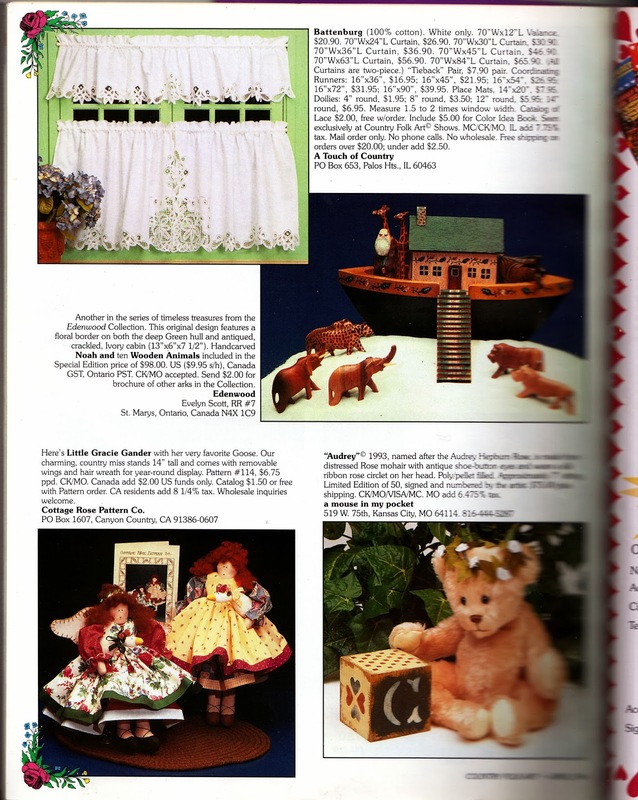 Every single time, without fail, he would say: “If a person was going to do many of these, they would design a jig.’ And every single time, I would query … ‘How MANY is MANY?’ considering it went on for almost five years and over 600 arks. 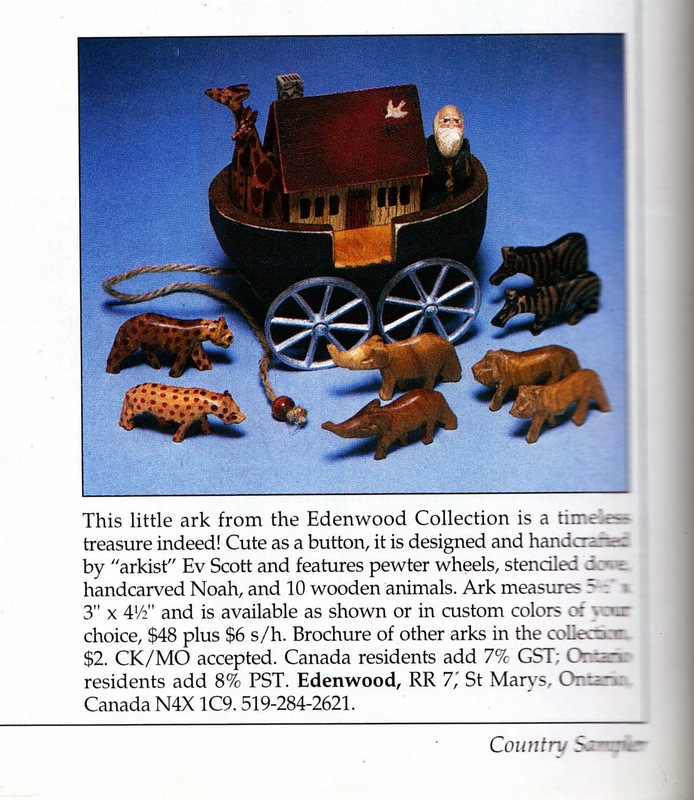 Arks with my own carved animals were not as plentiful as it’s hard to sit and whittle away on animals when just keeping up with the boats and Noah was time consuming. I recall being on my way to the shop once and turning around when I was half way there, to go back and get the ark that I had just completed. It was the only one I had been able to do that year. I wasn’t at the store five minutes when a lady from British Columbia came in. She was visiting in Toronto and had made the trip to Sebringville just to get one of my Arks as a wedding gift for her son since that’s what she had given her other two children. She was under the mistaken impression that I always had them in stock. And they’ve been even fewer over the past ten years. If I get two done in a year, it’s a big deal. My intention was to make one for each of my grandchildren when they were born, but unfortunately I never got past my firstborn. He’s twelve years old and NEVER did get the bottom of the boat – he’s just got a cabin. There are a few issues that have been responsible for the lack of production. Burn out was one. After that many I needed a decade of space to even think about it again. 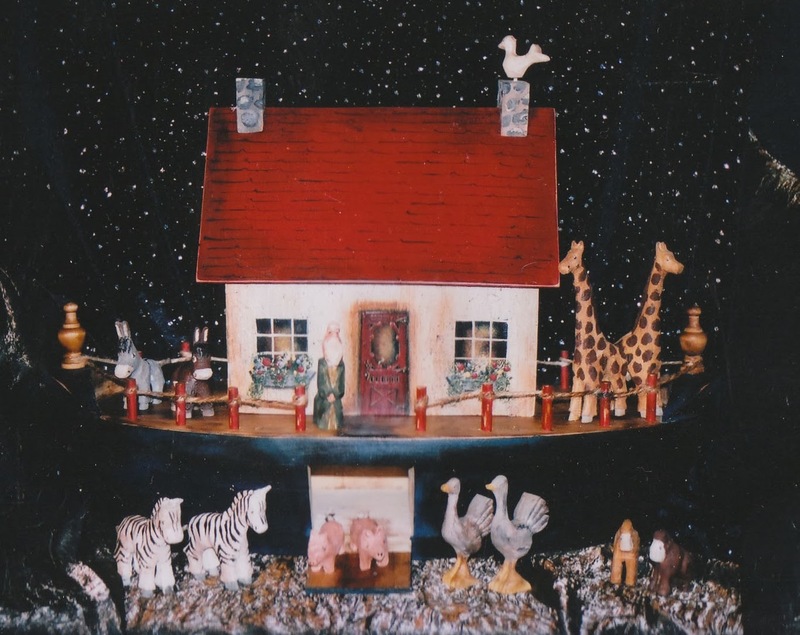 I also got into sculpting and creating my Christmas line, which is pretty well all consuming. Then the invention of DSLR cameras fed my lifelong passion for photography and has hijacked 80% of my time. And then there is Newfoundland. When you take seven or eight weeks out of the months that I’m able to work in my unheated wood shop, it doesn’t leave a lot of time to sit on the back porch and whittle away the hours. 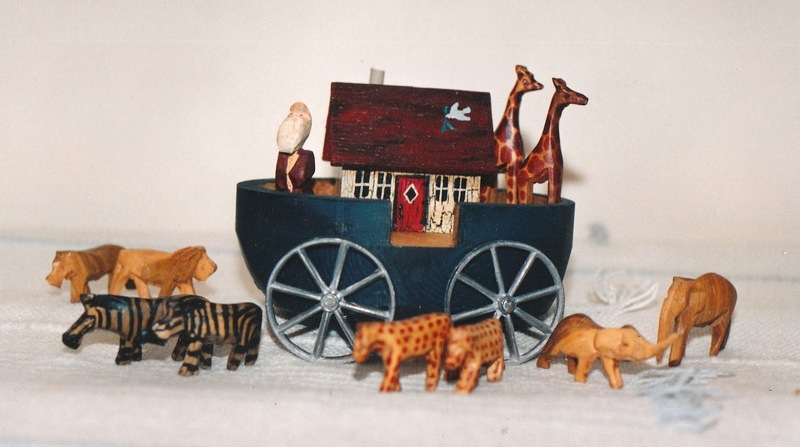 But I have decided that this year I am going to rectify that in honour of the 25th Anniversary of ark building. I really do love creating them and it’s time I put that activity back into my life. Who knows, Scotty may even get the bottom of his boat. Wow - this brings back some memories!!! You are amazing.